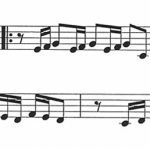 Sheet music, also called music notation or musical score, is a musical transcription that reproduces the melodies and the rhythms of a song or an instrumental piece of music in a printed form. Arabic sheet music are normally transcribed on the Treble Clef since all Arabic music instruments (Oud, Kaman/Violin, Qanun, Nay, and oriental keyboard) use that same staff. On this page, we offer you free sheet music for famous Arabic songs and Arabic instrumentals. Many of the free sheet music for musical pieces and songs below are listed with their relative audio files, which allows you to listen to the music while reading the sheet music. Please bare with us as we will be adding more free sheet music files and enhancing the quality of the existing ones in the near future. If you have any suggestions or request, please do not hesitate to contact us for that! 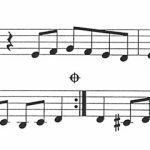 If you like the free sheet music files on this page, you may be interested in purchasing more advanced and well-written sheet music on our Buy Sheet music page! Download FREE Arabic Sheet Music instantly!